Dissident Veteran For Peace: No Outcry Over "Far Cry 5"
No Outcry Over "Far Cry 5"
National Public Radio did an almost 6-minute infomercial today on the music of the new Ubisoft release, Far Cry 5. FC5 is a first-person shooter game where the player is a sheriff's deputy and the bad guys belong to Eden's Gate, an evil cult in Montana. I haven't played the game but various media reports indicate the cult is Christian-based (see here and here). One of the cover art pieces (see image at right) is a clear reference to Da Vinci's "The Last Supper" and then there's the baptism trailer. "[That] brings us to the creative of the game," Hay said. "We are going to Montana. We are going to the frontier of Montana in present day. What we learned there is this concept of 'freedom, faith, and firearms.' People in that region, they don't want to be fucked with. We're applying that to Far Cry. We did that two-and-a-half years ago. But even today, this morning when I turned on the news, this concept of dissatisfaction, feeling like something is wrong, something is off. It brings me very much back to when I was a kid. I don't know that I feel safe." Hay's words seem to also echo Obama's notorious bitter clingers remark. I realize that my limited engagement with the game is no substitute for having actually played it. My analysis here though is not really so much about the game itself as about the mainstream media response to public representations of FC5. Thus, listening to the fawning NPR piece left me wondering how they would cover a mirror-image game where the first person shooter is a militia member or a deputy sheriff who is gunning down a caricature of the Left, say evil prominent Lefty gun controllers who are surrounded by armed guards and based in New York, for example. What about a game taking out protesters run violently amuck, based loosely on Black Lives Matter or Antifa? Methinks Ari Shapiro et al. would not similarly overlook the dynamics of who was shooting whom and why in such a game. A gamer friend made a search and found no such parallel games to FC5 with contemporary center-Left villains so we needn't worry, I suppose. Some Lessons of "Unintended Consequences"
08 April 2018 update: I've done a bit more reading of and about responses to FC5. Unsurprisingly, I'm not the first or only person to think about the ramifications of using an identifiable, albeit exaggerated, contemporary American political/cultural subgroup as the targets of an FPS game. 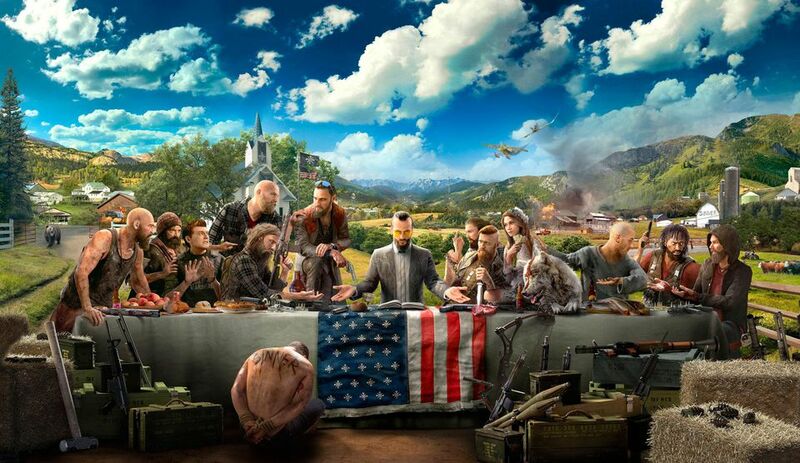 Last year, Chris Plante wrote in The Verge: "But Far Cry 5, should it commit to the direction the key art suggests, will be the biggest and most aggressive game to adjust the sights of the first-person shooter genre against people in the United States .... The game promises a conversation about ... why it became acceptable to murder virtual versions of one group of people, but not another." Unfortunately, I see very little evidence of the promised conversation taking place. There have been complaints about why the "bad guys" aren't more clearly identifiable as members of the real "alt-Right" and other perceived nemeses of the Left. As Adi Robertson put it, writing more recently in The Verge: "many reviews have criticized Far Cry 5’s cult for not drawing on real Christian Fundamentalist or neo-Nazi ideology" (that would likely be the Left's insupportably expansive definition of neo-Nazi ideology). Relatedly, some are also unhappy that the "good guys" aren't more clearly not conservatives. The two links below astutely critique in much greater detail some left-of center responses to FC5. "SJWs Complain That Far Cry 5 Isn’t Anti-Conservative, Anti-Christian Enough"
"Gamespot Whines About Far Cry 5 Portraying Conservatives As Good Guys"
I have spoken to several people in the games I play, and while many are rather conservative, there does not seem to be any interest in a shooter which would have exclusively liberal targets. This next is conjecture, but I got a sense that the people I spoke with are not mean-spirited enough for such a game to be attractive. Even among those who are Trump fans, an interest in such a thing does not seem to exist. Make of that what you will.